How do we move GRC from the tactical to the strategic? For the past decade, organizations have been challenged to improve risk and compliance processes. In many aspects, this as been focused on removing redundancy and improving efficiencies. While these are important objectives, the optimization of GRC processes has remained a tactical effort. Organizations are now determining how they should align GRC strategies to improve business performance and integrate GRC with the business. 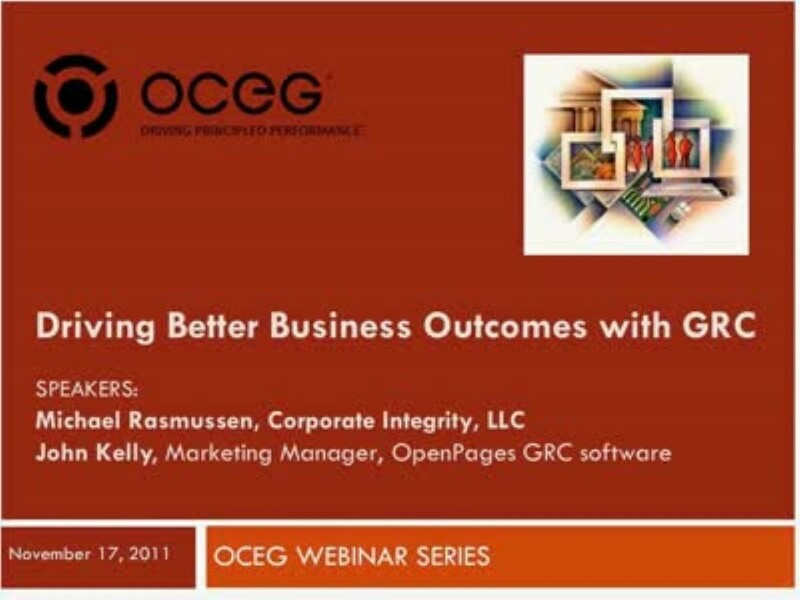 In this webinar, Michael Rasmussen, who chairs the OCEG Technology Council, and John Kelly of IBM OpenPages will be taking a look at how companies are beginning to use business analytics in conjunction with their GRC programs to derive insight about business operations and manage effectively through a constantly changing risk and regulatory environment. We have emailed instructions to access Driving Better Business Outcomes with GRC to . Make sure the email arrives in your inbox: either add "support@oceg.org" as a safe sender to your email platform, or if you use Gmail, drag our email into your Primary tab.